Transfer protects giant sequoias and clean water. Our recent purchase of land helps protect the surrounding Giant Sequoia National Monument (pictured), home of some of the Earth’s largest trees. In the rugged Sierra Nevada mountains, up a winding, remote dirt road, you’ll pass amazing giant sequoias. Eventually, you’ll reach property where younger sequoias grow. Save the Redwoods League in December 2011 purchased this land to protect clean water and the magical giant forest. Now it’s under the care of the US Forest Service (external link). Our purchase of the land, thanks to your gifts, protects the property’s unnamed creek from degradation that could result from more development on this land. Safeguarding this creek, in turn, protects the Middle Fork of the Tule River downstream. This river is a priority to protect because it’s an important water source and home for wildlife. In addition, this purchase helps protect the surrounding Giant Sequoia National Monument, (pictured, home of some of the Earth’s largest trees) because the health of our forests is connected. In the same way that pollution upstream will flow down and affect the water of a town hundreds of miles away, what happens in one forest can have a direct effect on the health and survival of another. Some giant sequoias that are alive today have been standing since the time of the Roman Empire, more than 2,000 years ago. In fact, there was a time when redwoods covered the entire Northern Hemisphere. 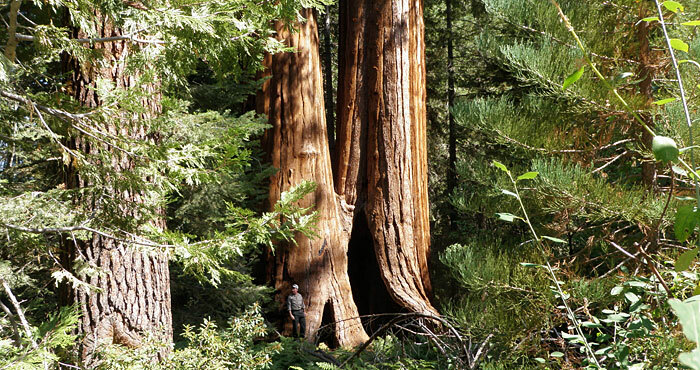 Today, you can only find giant sequoias growing naturally in the Sierra Nevada. We don’t yet fully understand why most have disappeared and how some have stood the test of time. Unlocking those mysteries through our Research Grants Program can help us answer big questions that will protect the health of people, wildlife, redwood forests and the entire planet. The property was recently transferred to the US Forest Service, which manages the Giant Sequoia National Monument, for its full fair market value. Earlier this year, a cabin on the property was removed by the League with help from the former landowners to help return the property to its natural state. You may visit these secluded 60 acres by dirt roads or by hiking trails over US Forest Service land. The property is southwest of the town of Camp Nelson in the Black Mountain Grove of giant sequoias (external link). High-clearance vehicles are required to reach this grove. “The US Forest Service is proud to be a longtime partner with Save the Redwoods League, which has facilitated the purchase of this property,” said Kevin B. Elliott, Forest Supervisor for Sequoia National Forest and the Giant Sequoia National Monument. It took $300,000 to protect this land. Help us secure more magical land by donating today.